MAMBAJAO, Camiguin – The woman who was shot by her own husband while attending mass on Sunday morning suffered physical abuse from her spouse and sought government help on several occasions. 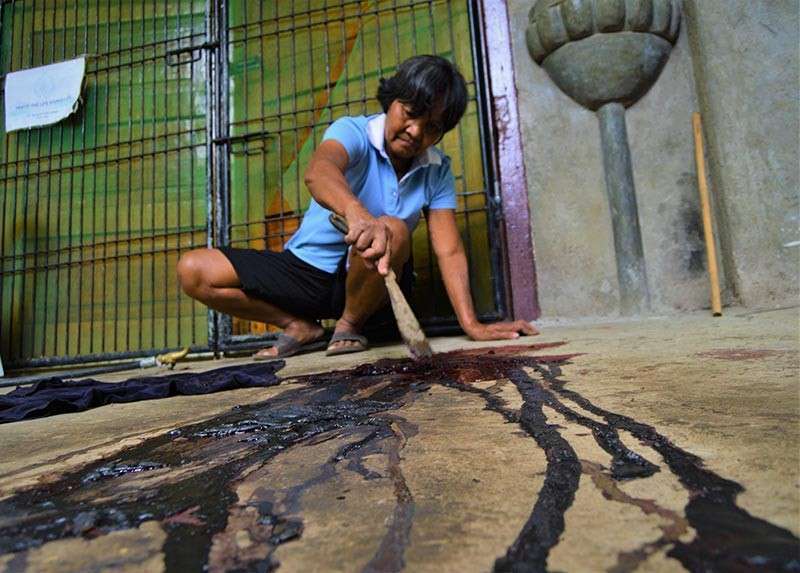 On Sunday morning, Ivy Linao, a mother of seven, was attending church service at the San Roque Parish church in Barangay Poblacion, Catarman, when her husband, Celmar, barged in the middle of the mass and tried to shot her. The gun however conked out and Ivy managed to run outside the church. Witnesses said Ivy ran toward the side entrance of the church to flee but her movement was hampered as she was tagging along one of her kids. Police said Ivy was hit by a lone bullet that went through her left arm as she tried to shield her face but it penetrated her skull causing her death. Her husband, Celmar, 37, pointed the gun at his head and fired a single shot. The couple and their children were residents of Barangay Compol in Catarman. Compol chairman Edilberto Bailo said Ivy sought help from barangay officials several times for being beaten by Celmar. Bailo added even the couple’s older children were not spared from the physical abuse inflicted by their father. SPO1 Rosemarie Bana, the Catarman police Women and Children’s Protection Desk officer, said the wife came to her office sometime last December to ask advice on their marital situation. Bana said the husband allegedly threatened the wife after he felt jealous but she did not file any complaint at the police station, instead she was advised to file a legal action before the Lupong Tagapamayapa. P02 Ritchie Babia, Catarman police assistant investigation officer, said jealousy could be the motive of the killing. Babia said the couple had separated a few months ago after Ivy discovered Celmar was having an affair. Celmar was said to be a former overseas Filipino worker who used to work at Catarman municipal hall. Fr. Rolly Aniscal, a visiting priest who officiated the mass when the shooting happened, said he saw the husband pointing the gun at the wife beside the altar. The priest said he resumed the holy mass 20 minutes after the incident and told the parishioners to say a prayer for the dead couple. “I told the people to be silent for a minute and offer a prayer for them, then I continued saying the mass,” Aniscal said. A parishioner who was at the church when the shooting occurred said what happened was tragic. “It was the first time that such incident happened here in our town. Catarman is a peaceful place and we couldn’t believe that this happened,” the parishioner said. Recovered from the crime scene was as .45 caliber pistol and two spent shells.